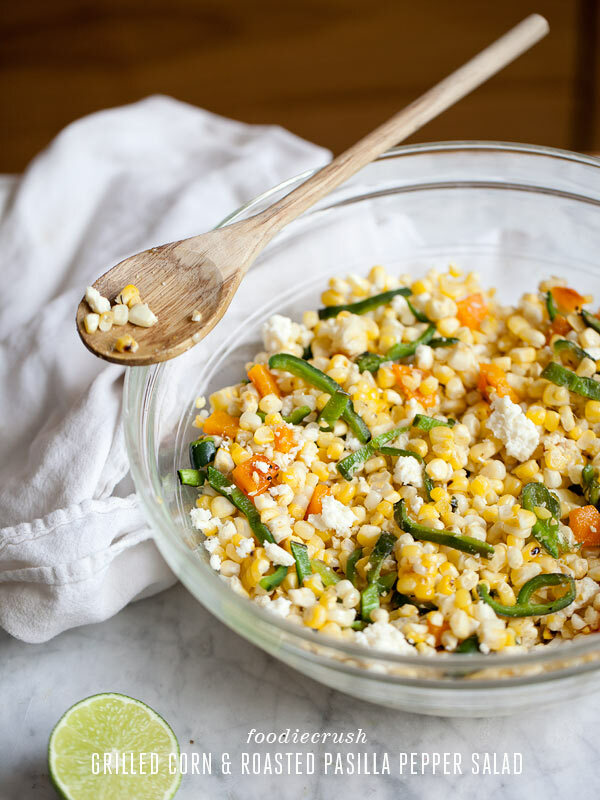 Roasted corn, peppers, feta cheese, and lime make this a great salad that goes well with almost any dish. Prepare grill to medium high heat. Soak corn cobs in water for 30 minutes. Remove and shuck corn cobs and remove silks. Roast corn cobs and peppers on grill for 3-5 minutes, turning frequently. Remove corn from grill. Continue to roast peppers until skin is charred. Remove from grill and let sit for 5 minutes. Rub charred skin off of peppers and cut into thin slices. Cut kernals from cobs. Place corn and peppers in a large bowl. In a small bowl, melt butter in the microwave or melt in a small pan on stove. Add cumin to butter, mix and add to bowl of corn and peppers. Squeeze fresh lime juice over mixture, toss and season with salt. Top with chunks of queso and serve warm or at room temperature.